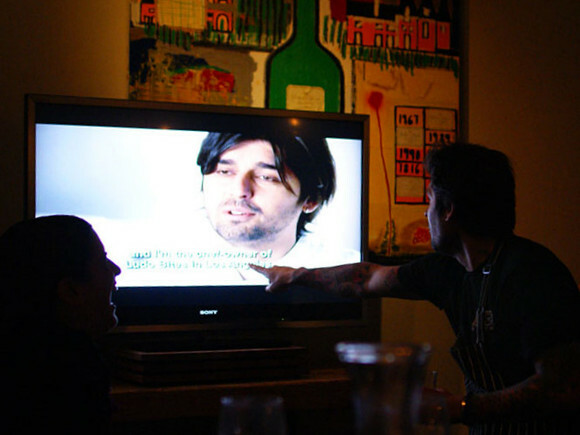 Chef Ludo Lefebvre‘s French-rooted culinary training and rise through the fine dining ranks may have been conventional, but these days, he’s thinking firmly outside the box. Ludo Bites is a “guerrilla-style pop-up restaurant event” created by the Chef to serve well-crafted and innovative food without breaking diners’ banks. By teaming up with Bread Bar in West Hollywood, a restaurant that’s only open for breakfast and lunch, overhead is kept to a minimum and savings are passed on to eaters. In addition to redefining what constitutes a restaurant, Ludo is also experimenting with his food. Heavily influenced by his mentor Pierre Gagnaire, the Chef serves up plates featuring jarring juxtapositions of flavors, tastes, textures, and ingredients. Ludo Bites is a thoroughly eccentric and eclectic dining experience that really is like no other. 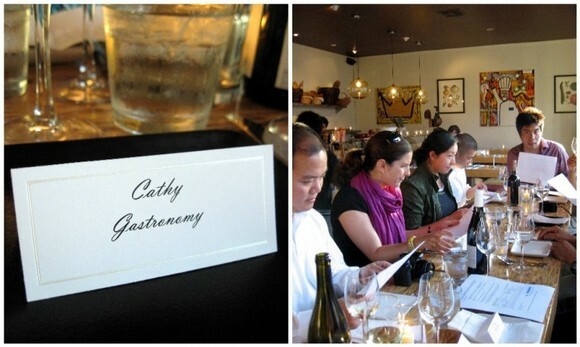 What’s extraordinarily cool about Fooddigger events is that they’re completely inimitable. For this dinner, Fooddigger worked closely with Ludo and his wife Kristine to orchestrate a feast featuring both on- and off-the-menu creations. Dining experiences like these come but once in a blue moon. Dinner started off with a bang—a deconstructed Bloody Mary served on an over-sized chilled spoon. The one-bite wonder smacked of sweet tomatoes, sinus-clearing Worcestershire, and a pinch of celery. 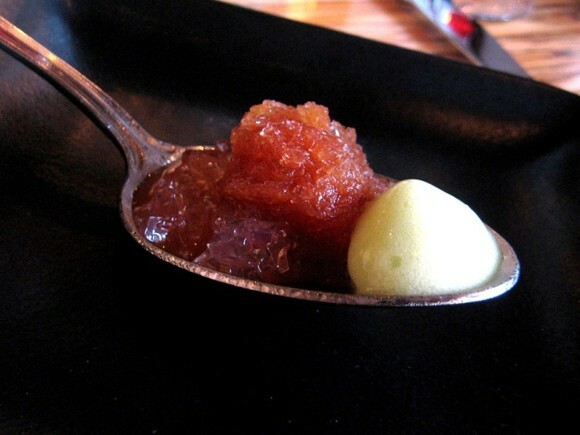 The glob of textured jelly caught me by surprise due to its resemblance to crushed ice. With Ludo in the kitchen, things are often not as they appear. 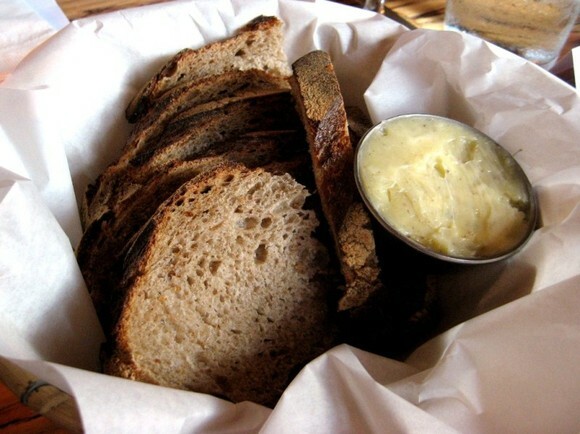 Breadbar’s honey wheat bread with a side of Ludo’s honey lavender butter arrived next to calm our taste buds with its sweet and rich goodness. My favorite course of the evening arrived early in the game—tuna sashimi with sushi rice ice cream, fried shallots, and shichimi togarashi (Japanese 7-spice blend). Eaten alone, the ice cream tasted vinegary and unpleasant. 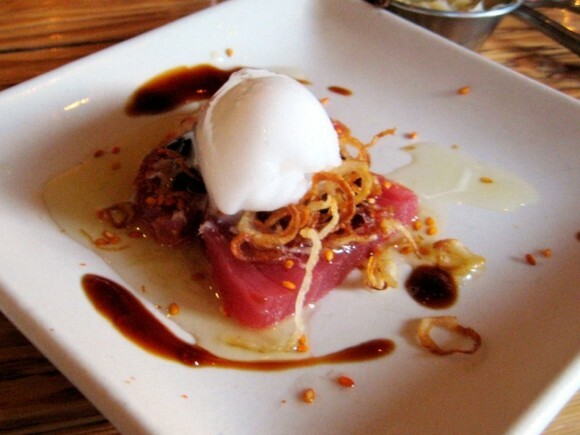 Consumed in tandem with the soy sauce, sesame oil, and luscious cuts of tuna, the amalgam of flavors screamed out sushi! Experiencing a distinct flavor profile without the textures to match up was a thrill for the senses. The third course to arrive was a singular and succulent sweet and sour shrimp with rosemary and lemon zest. We were advised to eat it all in one bite. 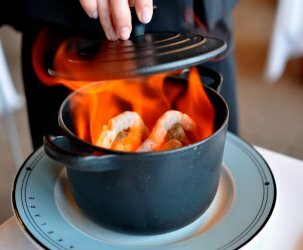 Achieving a perfect balance between sweet and tart, the marmalade-like goop atop the shrimp was what really made this dish great. One of the least impressive dishes of the meal was the King red salmon with smoked vinegar, watermelon, and mint. 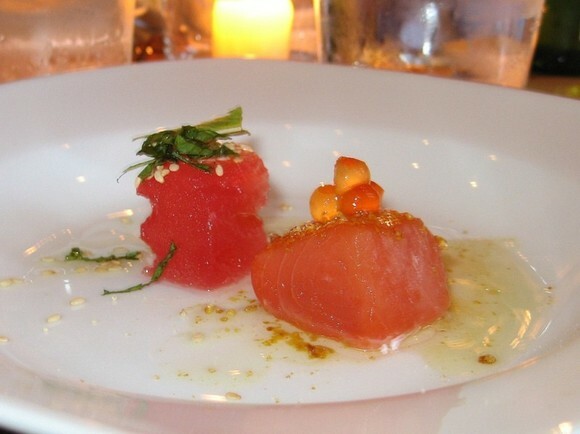 The dish was to be finished in two bites—first the cube of salmon with roe, and then the watermelon with mint. The fruit, fish, and garnishes were all fine, but the whole was not greater than each individual part. I was hoping for some sweet and salty interplay between the various ingredients, but that wasn’t to be. 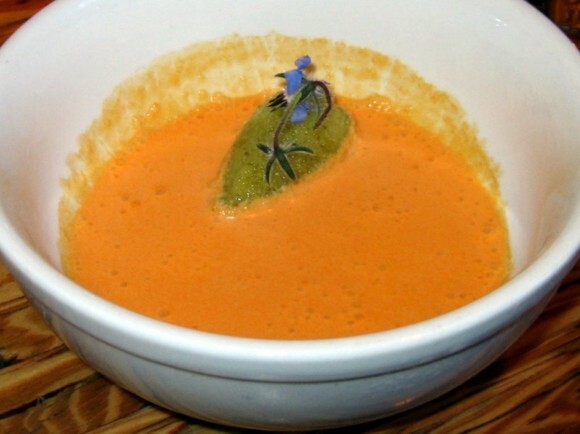 The chilled and smooth chorizo soup with onion and cornichon ice had the whole table talking. 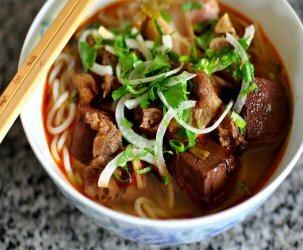 The wickedly orange soup tasted of smoky sausages and a bevy of savory seasonings that reminded me of vending machine fare. Like Doritos and Combos, the soup had an addictive and very appealing quality to it. My dining mates and I made sure to scrape the bottom of our bowls for every last drop. As Victor of Grubtrotters duly noted, the vessel was sadly too deep to lick. 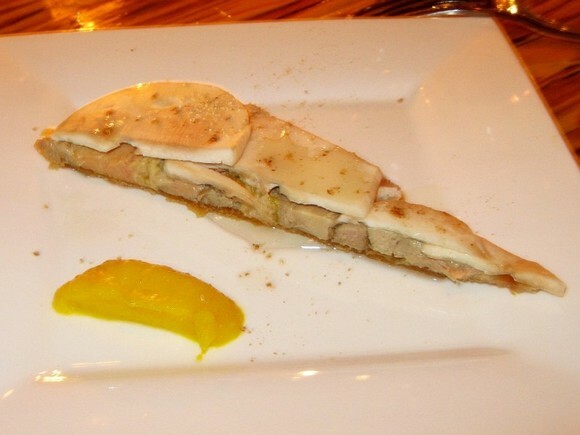 My second favorite course of the night was a foie gras tart with maple crust topped with sliced mushrooms and truffle oil. A sour lemon paste was served on the side. The tart’s wild combination of flavors and textures were completely unorthodox, unabashedly bold, and worked together ingeniously. For me, this creation epitomizes the Ludo Bites experience. One of the evening’s best dishes was followed up with one of the least strong. 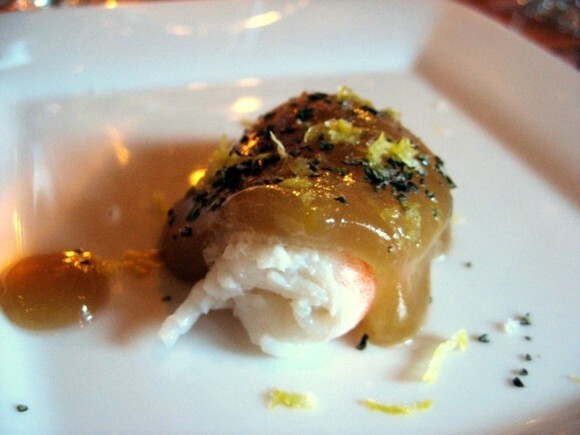 The diver scallop, with port, crème fraîche, pickled onions, and orange zest failed to come together. 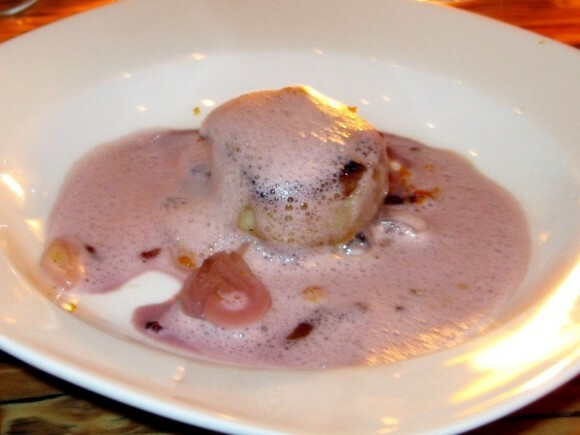 The scallop was cooked properly, but its accouterments did everything in their power to detract from its sweetness. The pickled onions were harsh, while the zest was bitter. The Tonnato-style halibut with spiced butter, fresh porcini, and wilted lettuce was cooked impeccably. 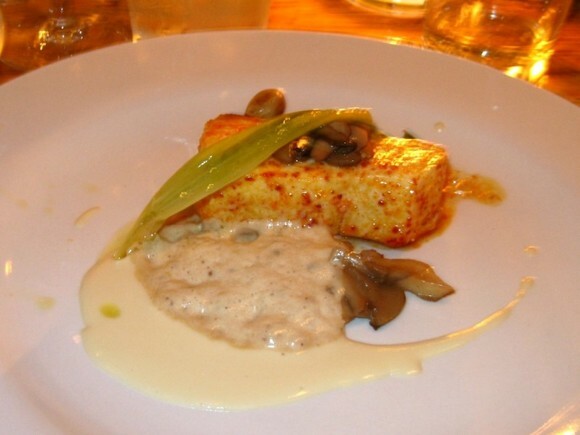 Whereas halibut usually has a flaky, steak-like quality to it, Ludo’s version was impressively moist. The dish’s flavors weren’t groundbreaking, but it’s impossible to fault a well-cooked fish. Our final dish before the cheese course was a beautifully prepared duck with an almond brittle crust, crispy skin puree, tapenade, turnips, and wasabi foam. The duck was cooked medium-rare and had an unbeatable texture. The sweet and crunchy crust contrasted tastily with the duck’s natural goodness. 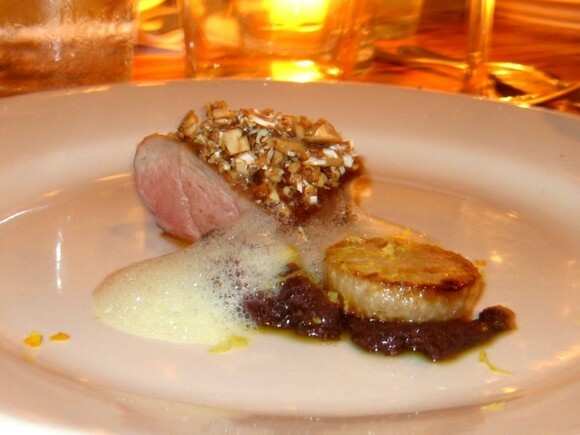 The tapenade, seared turnip, and wasabi foam disrupted the meat’s sweet harmony in the same way the pickled onions interfered with the scallop course. I finished the duck and left the sides untouched. Cheese courses usually don’t excite me, because the last thing I desire following a smorgasbord of food is a block of fatty richness. 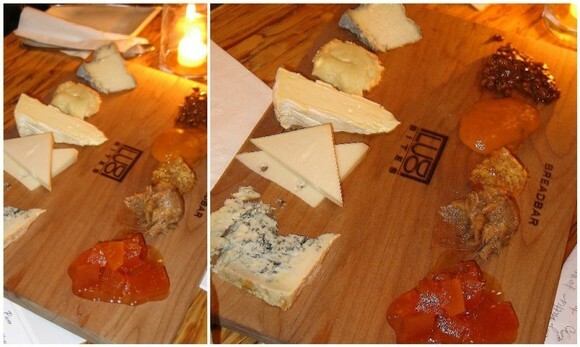 However, when cheeses are served with sweet and sticky accompaniments, my mood changes and I start getting territorial. Ludo’s cheese board was amazing. This evening’s selection included Brin D’Amour with toasted hazelnut with licorice, an Epoisse with honeycomb, Affinois with apricot paste and rosemary, Etorki with date puree, butter, and fleur de sel, and Valdeon blue cheese with Pink grapefruit gelee. Now, that’s a cheese course! The final course of the evening, a vanilla panna cotta with caviar and caramel, offered one of the most bizarre pairings of the evening. 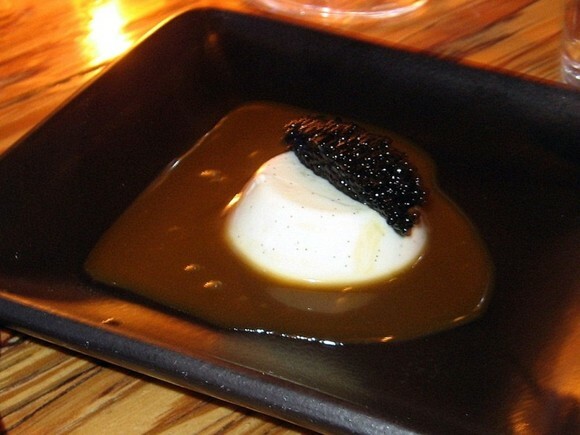 I was really taken aback by how well the pearls of caviar gelled with the velvety panna cotta and candied caramel sauce. 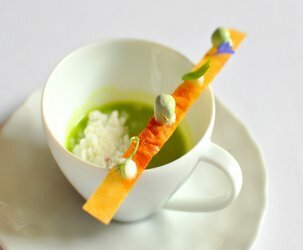 This creation really takes the whole genre of savory sweets to the next level by introducing notes of the sea. I couldn’t imagine a more perfect conclusion to our Ludo Bites dinner. Following our beastly meal, we sat back, relaxed and watched Ludo do his pigs’ ears quesadilla thang on Top Chef Masters. Kevin took this great photo of Ludo incensed that his English required closed captioning. 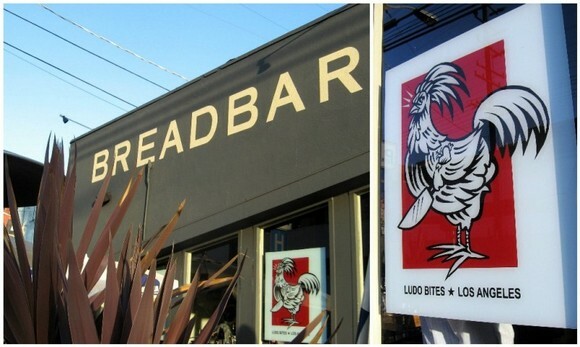 Ludo Bites will be calling Bread Bar home until August 22. A hearty thank you to the fine folks at Fooddigger for planning this spectacular feast and generously footing the bill. Thank you. Gracias. Grazie. Cám ơn! Wow, never really heard of FoodDigger..but benefits has it’s privileges it seems! Weren’t other TC contestants there too? Marcel? Ravenous Couple – Foam-loving Marcel was indeed in the house. I actually didn’t recognize him because I’ve never watched an episode of Top Chef due to lack of cable. Hey hey. Well written. I love re-living this meal through other people’s eyes. hmmm, the idea of a “guerilla” type resto isn’t actually a new concept- just the naming covention and marketing is a bit better. In Orange County, Rooster Cafe (Costa Mesa) used to be the home for Hidden Kitchen, a restaurant born of love from two doctors by day turn restaurateurs by night (Thurs – Sun). They used to serve 3 course prixe fix menus for roughly 40 bucks. So successful was their venture that they have decided to close up temporarily to build new diggs. In their place another venture has sprung up to offer tapas style eat. wow, is foodigger a socal only presence? what a great meal with surprising taste sensations. That dessert sounds so intriguing. Pingback: Interview: Ludo Lefebvre, Ludo Bites : Smashbox Yello!